Clubby old-school dining in the Marina City complex. 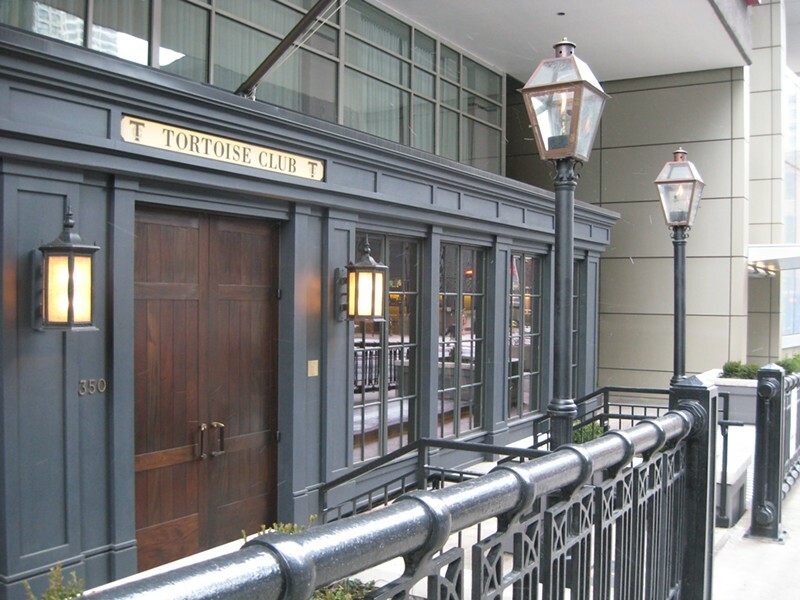 The Tortoise Club looks like a place your great-grandfather frequented—if he was a rich old white guy like onetime Sears chairman Robert E. Wood, whose portrait is ensconced there on a lipstick-red wall above a fireplace. Wood was great-grandpop to owner Keene Addington III, who transformed this quasi-subterranean space in Marina City into a mahogany-and-leather facsimile of an old-school dining club. But it's not stuffy: the vibe is warm and informal, service is attentive without being intrusive, and Tuesday through Saturday nights there's a mellow background of live jazz from the lounge up front (which stays open till 11 PM or later every night except Sunday). The relatively limited menu offers "classic" American food with a muscular "twist." An order of a half-dozen oysters included a trio of "Pickle Points" too true to their name; beef barley soup with Guinness was a savory, peppery, near-goulash. The large, tender Berkshire pork chop, a house specialty, rested on a bed of spinach and pearl onions, the whole thing doused with a maple-bourbon sauce not far enough removed from the stuff we usually pour over pancakes. Wild pheasant pie, another house specialty, could be gamy, but wasn’t: it had a buttery crust, a dash of delicious foie gras-cognac gravy, and a filling reminiscent of (I don't mean this in a bad way) Pepperidge Farm turkey stuffing, amplified with shredded bird and vegetables. This arrived with a flag of fried skin planted in its center, a decorative flourish that's supposed to be edible but has a lingering revenge-of-the-pheasant flavor. Dessert choices include standards like pecan pie, warm brownie, and tiny scoops of good "homemade" ice cream.